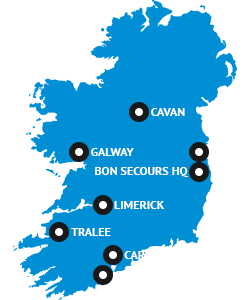 Admissions to Bon Secours Care Village are normally arranged by enquiry, following a pre-admission holistic assessment of physical, social and cognitive needs. All care at the Bon Secours Care Village is tailored to each individuals needs. On admission there will be some paperwork to be completed which includes a full nursing assessment and care plan. The residents' personal care needs and preferences will be set out to provide direction to staff members involved in providing the care. A review of the care plan and assessment will be carried out with the resident and any changes updated, at three monthly intervals or more frequently if required. Nursing staff in conjunction with care staff undertake a full assessment of the residents physical, emotional, cognitive, social, psychological and spiritual needs as part of the nursing care planning and evaluation process. Care is provided for residents requiring long and short term care, respite, palliative and terminal, post-operative care.